When Manuela Piancastelli first took a group of bloggers through the Terre del Principe in Campania she called it a “newer” winery. “It’s only 500 years old,” she said as she opened the floor and led us down the dark stairs to a cellar her and her husband – the dreamer – Peppe Mancini stumbled upon when looking for the perfect place to age their wine. This dark place dates back 10 centuries. Do the math: That’s 1,000 years. 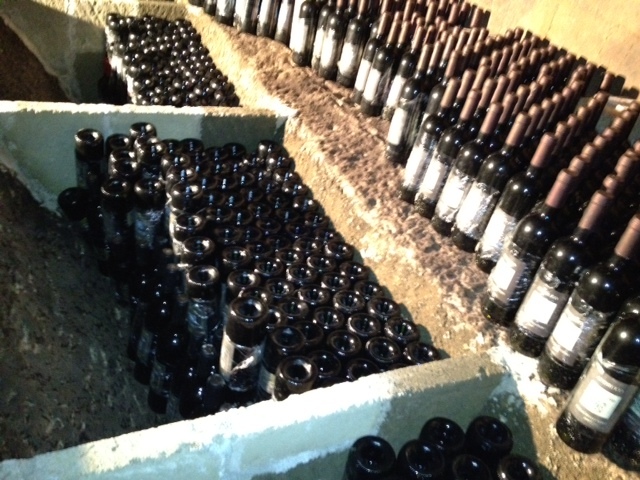 There were a scant 86 barrels in the cellar, dutifully labeled, and some 300 bottles with labels wrapped in plastic to save them from the humidity, which reached 80%. You would think the place would reek of mold, but the smell really wasn’t a nose buster. And the artifacts of aged-old wine de-stemmers, spooky corners and scales of steps led to great picture taking. Terre del Principe makes seven distinctive wines, mostly from only three indigenous grapes specific to the region: Pallagrello Bianco, Pallagrello Nero and Casavecchia. These were mostly new grapes to us and piqued our taste buds and interests. Moreover, the taste sensation of pairing them with what has to be the best homemade mozzarella and ricotta cheeses and melt-in-your-mouth pizzas this side of paradise no doubt added to the experience. And if there’s anything we’ve learned while traversing through Umbria is that wine is not just a beverage, but a way of living. The winemaker is Luigi Moio, who Manuela calls “the brains” of their winemaking operation. Luigi, who is a professor of oenology at the University of Naples, unearthed these three grapes that have led to yet another source of wine in a country that has more than its fair share of fabulous vino. The best of the bunch were the Ambrusco 2009, a 100% Pallagrello Nero that showed a rich ruby color with hints of dark fruit, black leather, cherry plum and just a touch of tobacco on the nose. It ended with a very fine acidity and tannin structure. The Fontanavigna was a bright, clean refreshing take of 100% Pallagrello Bianco that paired remarkably well with that mouthwatering mozzarella and smooth-as-silk ricotta – made on the premises by a man whose name we never learned but whose face we will never forget. The Il Sasso di Riccardo, a Passito di Casavechhia, wrapped up the tasting as a semi-sweet red wine that the guy with no head – look at the pictures, we never learned his name – makes cheese specifically to be paired with this wine. The wine starts sweet, but once touched with spicy and strong cheese, so strong that Manuela would not let us even near it till lunch was ending, takes on a new life and finishes dry. On an aside, the pizza wasn’t what we Chicagoans consider “pizza” per se, but it might rank as one of the best slices of dough, tomato sauce and cheese that was ever put together. 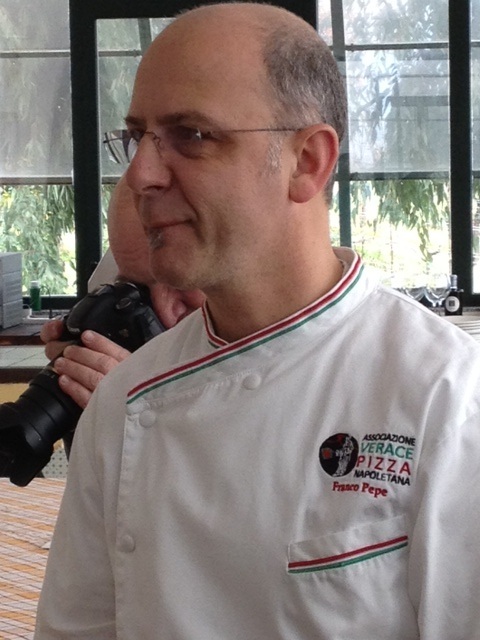 Luckily for us in the Windy City, the chef, Franco Pepe, will be opening a pizzeria with a partner in our town this year. Now if we could only get that Ambrusco over here then too…. Nice article on my family’s favorite winery. We have visited Terre del Principe twice over the past two years. Last year we spent 4 nights at Terre del Principe’s “bed and wine”. Manuela and Peppe are perfect hosts – great ambassadors for wines from Campania. I live just outside of Boston and I have been able to get Terre del Principe’s wines from the importer Vias, to the local distributor, MS Walker, to the local wine shop Vintages in Concord. If there is a break down in the chain, I go directly to NYC and visit Wine Crush, another wine store to get Terre del Principe wines. I am aware that Terre del principe is imported to Minnesota and I believe Missouri. These locations are closer to Chicago. It takes persistence to get small cult wines from Campania, but it well worth the hunt. Good luck in finding Terre del Principe.